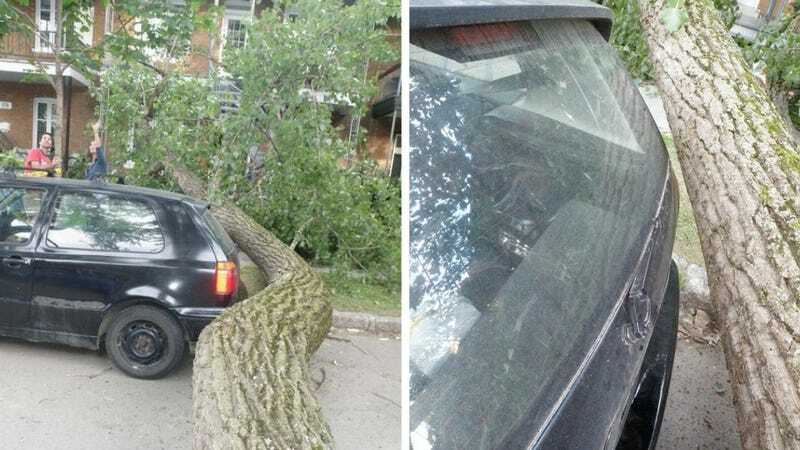 This shot of a tree falling within inches of a friend's Golf by Reddit user dralios shows just how lucky you can be, even if you're stuck driving a beater MkIII Golf. A tree falling in the night this close to a parked car definitely looks staged, but the person who took this picture claimed, "I will swear on my grandmother's grave and my family name" that "I am definitely not smart enough to plan something of that scale! But in all truthiness, this thing kinda just happened." In all seriousness, it seems more likely the VW owner would push the car under the tree for the insurance money than up next to it for the karma.